This class covers the 36 movements of Chen Style Tai Chi Chuan. 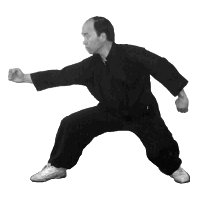 The form was originally taught by Master Adam Hsu in the early 70's and focuses on Silk reeling (chan si jin) energy and low stances. The practitioner will learn basic warm up exercises, long fist (Tan Tui), Qi Kung, and 36 Simplified version of Chen Tai Chi. This class is primarily taught by Master Kurt Wong and is designed to improve your health and develop your internal energy. Instruction in Chen and/or Yang style Tai Chi, emphasizing proficiency and synergy in form, internal energy generation and application. Master Wong introduces experienced students to advanced forms in this class. This class covers 32 Yang Style Tai Chi and 18 Immortal (Luo Han) Qi Kung exercises. The 32 movements of Yang Style Tai Chi was originally taught by Grandmaster Liu Yun Chiao, the founder of Wu Tan in Taipei, Taiwan. The 18 Luo Han (immortal) Qi Kung will be offered along with Yang Tai Chi to enhance Qi flow and re-energize body agility. This class is designed for beginners to improve one's health and coordination. Also offered, periodically, are 45 Yang Style and Tai Chi Sword. A support class for Beginning Kung Fu, emphasis is on drills and practice to improve the skills and tecniques learned in the main class. All students are welcome. Ba Qua Zhang, or "8 Trigram Palm", is one of the three main "Internal" styles, related closely to both Tai-Chi Chuan and Hsing-I Chuan. Ba Qua lends itself to being one of the most simple and most difficult styles due to its unusual and sometimes awkward movements and the training process that the practitioners will go through; many of the underlying philosophies are also difficult. These characteristics make it an extremely effective Martial Art as well as an excellent conditioner of the mind and body, while remaining a style that fits all types and levels of students. This class will touch on the basics, drills, and mind-set necessary to begin the road of study into Ba Qua Zhang as handed down through the Wu Tan lineage. Also offered is instruction and practice in Tai Chi Chuan, intended to support the training in regular classes. A Weapons class, Tai Chi Saber offers the same mental and physical benefits that open hand Tai Chi does. Interacting with a weapon in one's hand provides additional challenges and some find this more interesting than the open hand forms. All the principles of Tai Chi apply to use of the saber. Master Wong teaches Baji Quan and Piqua Zhang. Open to disciples only. Master Wong teaches Ba Gua. Geared towards fun while teaching the basic movements, body mechanics, kicks, punches, forms and confidence students will need in more challenging classes. Saturday 10:00-11:30am. This class is presently combined with Kid's Kung Fu. Class emphasis is on basics, drills and forms from multiple styles offered at Wu Tan and is geared to assist students in progressing at their own level.